Colorado Gov. 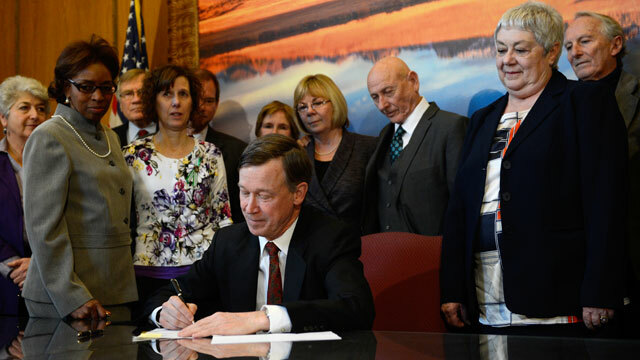 John Hickenlooper signs three gun-control measures in his office at the state Capitol, March, 20, 2013. A slew of new gun restrictions in Colorado might mean recall elections for Democratic lawmakers. Efforts are underway to recall three state senators and one representative who voted for a slate of new gun measures, signed by Democratic Gov. John Hickenlooper March 20. After a nonprofit group failed to organize the recalls with centralized (and undisclosed) funding, the campaigns are being run by activists spread out across the state. Gun-rights supporters are collecting signatures to recall state Senate President John Morse, state Sens. Evie Hudak and Angela Giron, and state Rep. Mike McLachlan, with more recall efforts are on the way, activists say. A website and Facebook page promote the recall of state Rep. Rhonda Fields, who sponsored two of the recent gun bills, but the Colorado Secretary of State's office said it has not received an application for a petition to recall Fields. READ MORE: Gun Debate Rolls on Outside D.C. Along with Connecticut, New York, and Maryland, Colorado enacted its own gun restrictions this year as federal efforts stalled in Congress. Three new laws expand background checks, institute fees for the checks and ban high-capacity magazines. Colorado became a focal point of gun politics in 2011, after the mass shooting that killed 12 and wounded many more at a movie theater in the Denver suburb of Aurora. The campaigns are being run by political newcomers who claim little or no experience working on elections and say they were angered by the recent gun votes. "There is no way to have a universal background check without gun registration," said Dave Saleh, who is helping to organize the recall of Rep. McLachlan in the rural southwestern part of the state. Opponents fear that background checks will lead to a "national gun registry," which they say would mean excessive government monitoring of gun owners. Saleh said he was not surprised by McLachlan's vote but that he was surprised Hickenlooper signed the bills. "It shows what he really is, which is a liberal progressive," Saleh said. "We're going to damn sure deal with these politicians here, if not with the recalls then in 2014. ... This momentum will carry us into 2014 and beyond, this legislation in Colorado has been so overreaching." Three of the lawmakers targeted by recall campaigns won their seats narrowly. Morse, the Senate president, won his district by 340 votes, or 0.18 percentage points, last year; Hudak won hers by 584 votes, or 0.23 percentage points, in 2010; and McLachlan won his House district by 917 votes, or 1.16 percentage points, in 2012. Not all of the recall efforts are about guns exclusively. Leaders of the Hudak campaign told ABC News that their effort is driven by a general distaste for Hudak's politics, bristling at the notion that guns are the main issue. While their petition includes an accusation that Hudak "has infringed upon our constitutional right to keep and bear arms," it also accuses Hudak more broadly of "ignoring the voice of the people" on issues like taxes. "This recall is not just about the 2nd Amendment," organizer Kandee Evans wrote to ABC News in an email. None of the recall campaigns would say how many signatures they had collected so far, but Saleh admitted that it would be "very difficult" to obtain the 10,587 signatures necessary in his rural district. Other campaigns projected confidence that they'd be able to meet the signature requirements, all between 7,000 and 19,000 signatures. McLachlan and Giron represent the rural areas surrounding Pueblo and Durango; Morse and Hudak represent Colorado Springs and the Denver suburb of Westminster, respectively. The first petition was approved in mid-March, as the gun bills made their way through the legislature. Organizers will have to submit their signatures between mid-May and early June. If they succeed, the lawmakers could see recall votes between July and October. Voters would decide simultaneously whether they want to recall the lawmakers and, if so, who should replace them. Activists are relying on volunteers, and no campaign has raised more than a few thousand dollars. Victor Head, a plumber who is organizing the recall of Sen. Giron in the central Colorado town of Pueblo, says his volunteers have been collecting signatures in gun stores. "We've got eight stores in Pueblo, whether it be my volunteers sitting behind the counter or the employees themselves," Head, 28, said. "[At] the high-volume stores, we've got someone there all day, every day." Like other organizers, Head said he had never set up a recall campaign and didn't know how before this year. "I'm a plumber," Head said. "I've never done anything like this in my life." Early in the process, a nonprofit group called the Basic Freedom Defense Fund tried and failed to organize the recalls under one, centrally funded umbrella. Dave Palm, who runs a website affiliated with the Hudak recall, called the group "a lot of hot air and a lot of promises." Other activists said they found the fund's early support helpful. Even without the fund's overarching guidance, the petition campaigns say they're talking to each other by phone and sharing information. Basic Freedom Defense Fund does not disclose its fundraising and declined to who sits on is board. Anthony Garcia, a 27-year-old oil-field worker involved in organizing the fund, said the group's leaders are "normal people" who don't want to be identified for fear of reprisal from gun-control supporters. And he denied major influence or funding from national groups. "The Basic Freedom Defense Fund is a completely grassroots effort," he said. "We don't have any big corporate or political affiliations. We're just the average Joe." Asked whether any national or out-of-state groups had supported the fund, Garcia said, "There are a lot of groups who are interested in what we're doing. We're not affiliated with any of them officially. They support us, they love what we're doing, they try to help us." The Basic Freedom Defense Fund is now the driving force behind the recall of Senate President Morse. The official Morse recall committee, the El Paso Freedom Defense Committee, reported raising only $100 at the beginning of April, two weeks after Morse's petition was approved. For his part, Sen. Morse says he's not worried. "What they're accusing us all of is passing sensible gun legislation that 90 percent of the public supports, so how does that work to get 50 percent to [vote for a] recall?" Morse asked. A former police chief, Morse said he still owns the backup weapon he used as an officer, a Walther PPK. "I'm a crack shot -- crack," he said. "I don't enjoy it at all, but I'm good at it."